1. Place 1/2 cup of cream in a small bowl with a fine mesh strainer on top. Set aside. 2. In a small saucepan, combine the milk, the remaining 1/2 cup of cream, sugar, and salt. Bring to just a simmer. 3. Meanwhile, in a separate bowl, whisk together the egg yolks until light. 4. Once the milk is simmering, pour a small but steady stream of the liquid into the egg yolks while stirring constantly to temper. Do this slowly while whisking quickly. Once the milk and egg yolks are combined, return to the saucepan and to the stove. 5. Heat the egg yolk and milk mixture while stirring constantly, making sure to scrape the bottom of the pan so that nothing burns or sticks. Slowly cook the mixture until it thickens enough to coat the back of a wooden spoon. Remove from heat immediately once it thickens. 6. Pour the hot custard through the strainer into the prepared cream and stir to cool. Whisk in the vanilla extract. 7. Chill the mixture thoroughly. 1. Combine the peeled kiwi, sugar, water, and Grand Marnier in a food processor bowl and puree until smooth. 1. Pour each layer into the molds one at a time, freezing for roughly 30-45 minutes between each layer, depending on how thin you make them. The combination of kiwi and orange sounds wonderful! I have to make my own popsicles soon. But yesterday I just made a batch of raspberry ice cream. Not that bad either. Such a cute idea! Love the flavors in your layers. Fun to see Grand Marnier in the kiwi layer! OMGoodness, seems Summer is on everyone's mind. I just went to the Asian market yesterday to buy some exotic fruit to make something similar:0 Yours looks so fantastic as usual and gorgeous photography too!! 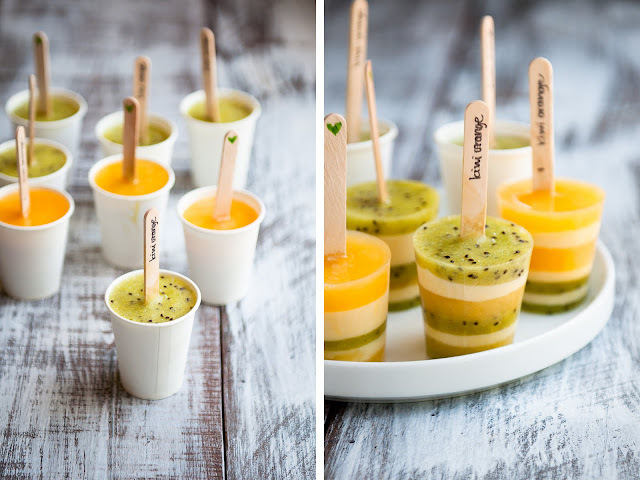 Such a fun twist on creamsicles! Love this! Do you by chance live in Davis??? I just finished grad school from Davis and I felt the same way--I hated arriving to class or meetings covered in sweat! But it seems like that's what everyone does, so it's acceptable? So strange. I ended up taking the bus to avoid this. I'm from the South, and my momma would slap me if she knew I showed up to class all sweaty and gross. But it's normal in Davis, huh? @Lena: mmmm... raspberry ice cream. Now you should just freeze them into pop form! I totally forgot about June Gloom! I was hoping the clouds would be gone for a while. lol. Well I have only lived in the bay area for a year (not counting my 2 years at UCSC) and I am not used to the weather patterns yet. At least we will have a beautiful May. These popsicles look awesome! I love how you used paper cups and wrote the flavors on the sticks. I have had no luck with popsicle molds. Those cups are a great idea. Anyway, thanks for the recipe! My daughter will love making these. I'm simply smitten with the colors in those pops. How cheery & beautiful. We haven't had much of a warm blast here yet, though I am awaiting. Your roof picnic sounds amazing! It makes me wish I had a garage roof so I could do the same thing, though with my level of clumsiness, it would probably be a bad idea. What a gorgeous idea! Do to pops come out of the cup molds easily? Do you have to spray them first? At what point do you put the stick in? Looks delicious! One could use any combo of fruits, really. I'm definitely trying this out! Looks wonderful! Completely inspiring for summer! Just to add to Shannon Marie's questions, when you say 'chilled' for the orange mix and the kiwi puree, do you mean freeze, or just in the refrigerator? These are stunning! Prettiest popsicle I've ever seen! What cute popsicles! Makes me want to throw a summer BBQ party right now. Thank you for sharing! @Shannon Marie: The pops came out of the cup molds very easily--just a few seconds if you warm them up between your hands, or a minute or so if you leave them out on the counter. You don't have to spray them first with non-stick. If you're using plastic molds, you can run them under hot water, which should release the popsicles easily. I put the stick in after a few layers at the bottom had frozen already. @Anonymous: Thanks for asking this clarification question! When I say "chilled," I just mean chilled in the fridge. you always have the most beautiful photos and the most inspiring food!!! What a great flavor combo! And they look so pretty! @Maya: I made this tabletop by staining and painting some old wood. Very beautiful!! I really would love to try !! First of all, the photographs are beautiful. Secondly, I love the little cup idea. I made yogurt pops just yesterday and while they tasted great, they did not release from the molds well at all. I'm going to give your cup idea a try. These photos are stunning! I stumbled upon your blog via another friend's blog! 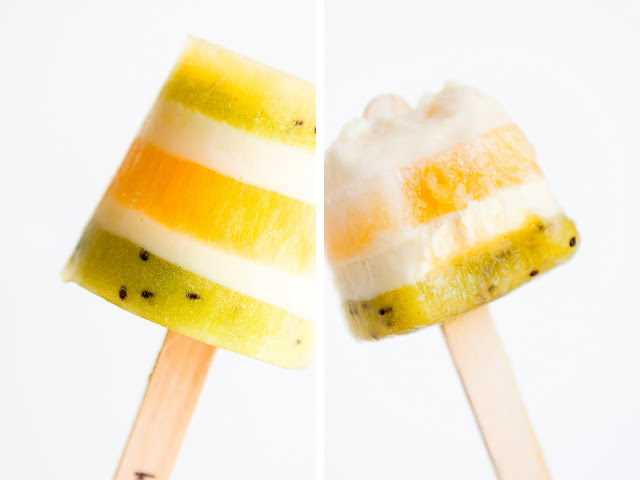 With our current hot weather going over here, your kiwi and orange creamsicles sounds wonderful!! I'm not sure if I can create these in miniature scale, but I'm just in awe with them! This looks so refreshing.. I just got a popsicle maker that freezes layers in about 5 minutes each.. cant wait to try this recipe! Thanks for sharing. these are so cool... i'd feel bad eating them. well, not that bad. The first picture was my sun substitute for this entire rainy weekend. Thanks for brightening things up here in Cleveland! these are so cool! i'm bookmarking them right away with my cookmarked.com account! What beautiful photos! I liked how you wrote the flavour on the sticks and the many layers. These remind me of when my dad would layer different colours of jello in a glass for me as a kid. Ahh! These are just stunning!! I want to make them!!!! These are adorable. I have my little nieces visiting next weekend. I could make these ahead of time! Even my teen son said yum when I showed him these. They are beautiful! These are so freakin' gorgeous! I just had to tell you how happy those make me feel, just looking at those pictures.